Welcome to Pokeworld, a brand new friendly community. We have every feature you could imagine on our server, Gym Leaders, PokeBuilder, PokeHunt and there's too much more to explain! We host weekly tournaments, where you can win awesome prizes and rewards and even fun events for example HideAndSeek. Feel free to join our wonderful community, and have an awesome time. We hope you all enjoy your stay here at Pokeworld. We are looking for staff members, if you think you're capable feel free to apply for the team! This server is great! It’s way better then other servers. It always has Pokémon spawned in, along with trainers. Pokeworld is the perfect server if you are looking for a fun pixelmon experience. From the first day I got on and got 5 people ambushing me with "welcome!" I new I was going to enjoy my stay. I've been playing for awhile now and I gotta say it, I'm hooked! If you don't try out this server that boy I feel bad for what you're missing out on. The spawns nice, staff are cool, spawn rates are consistent, and new content is always being introduced! This server is definitely a 5/5 in my books. Yo highly recommend this server they have friendly people , memes and cheez-its. come to this server if you like all those things yo. It's nice and fun :). I recommend it!!!!!!!!! I have played alot since i started. This is the best server i have even played on. There is a super cool spawn. cool bosses. cool gym battles. The server is very nice and very welcoming to new players. I recommend this server to anyone wanting to get started in pixelmon. the server is a straight 10/10 with the best mods and helpers and excellent builder. The best pixelmon community everyone helps everyone no matter the size of the task. All I can say is WOW this server is one of the best pixelmon servers I have ever had the pleasure to play my IGN is Zackaryisawesome and I only started 2/3 days ago and everyone is friendly and helpful not many servers are like that so I am giving this server a 10/10 atleast. and not that meny rude people like other servers. honestly I love this server a lot. the community is great and there's ton to do. there's a lot of goals players can go for like completing the dex or even becoming a gym leader on a very active server. I recommend to everyone! Great server, friendly and helpful staff. I enjoy playing on the server. Hi, my IGN is AscalonZX. This is Server is great, because there is so much you do like farming for apricorns, hunt for pokemon, and challenge yourself and others to battle or doing the boss tower. The Server is always changing too, similar to like how a game updates and there always a change-log showing what changed. The staff is a bunch of amazing people whom helped this server be as amazing as it is now. Thank you all. This server is full of amazing people, you're able to get all the legendaries, the staff are active and care about the server often! I've played through tons of pixelmon servers, and this one I plan to play on long as I can! Not doing this just for the shiny key and I have to say the server is great, the community is fantastic and the staff are nice and really helpful! Hello my name is AbigorTheRaged on minecraft here is a honest review of the server. what do i think about it ? well when i started out i felt welcomed within the server a very good community with helpful people for new players . down the road the mods seem to do a very good job in making this server to be community focused which makes the game enjoyable. if you want to team up there are trust worthy players and you meet many with different age groups so you get a taste of everything around you. i think the only suggestion i would advise for the server is the Gym Leaders should follow by the lv requirement like they do in the game to give it an authentic feel or make the elite four more player focused to give it more in depth. thats pretty much my only real complaint about it other than the positive feedback. I Think that this is a really good server and that it has a great enviorment. The staff are awesome the people here are awesome it's generally just great. This is one of the best server's I've been on when it comes to Pixelmon. They have gymleaders which is great aswell. IGN NijiMari - This server is amazing! The community is very close-knit and I feel at home here. Spawn rate is perfect. I highly recommend this server for Pixelmon!! This truly is the best one! First mix flour with eggs, mix it quite well, you can add some sugar in, mix it once again. Prepare a pan and place it in the over add some oil, turn on the flames, add the ingreditens from the 1st part bit by bit. Tadaaaaa you just made pancakes. 5/5 this is a fantastic server with a lot of wonderful people, the owner and staff are very involved and are always on top of things. In game name - LazyScorp -I've played on quite a few server, moderated on a few of them, and even after years of playing Minecraft and Pixelmon servers alike I have to say this has been the best one I have found to date with a friendly staff that does a great job at helping the players and a great player base :). My name is MustGetTheAPLUS and I really love playing on the server. It has a lot of great players who help and trade with each other. It is a great community and I already feel a part of it despite only being there for less than 1 month. I try to login as much as possible because it is so much fun. Won't you join the community? i have played on many minecraft Pixelmon servers but nothing like this. I really enjoy playing on this server and hope this server goes bigger and better. This server is a great up-and-coming Pixelmon server. The majority of the community is kind and fun to interact with! I've been on the server for about a month now, and it's been a fun ride so far! 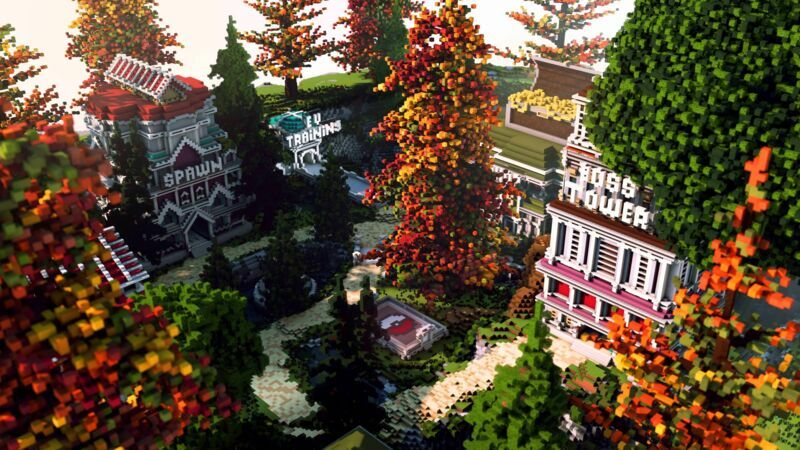 This is an amazing server, little to no lag, awesome events, an epic spawn, and a wonderful staff! I'm happy to be able to be apart of this server! Having just recently joined this server a few weeks ago, I can already say I love it. With shiny starters upon joining to the kits you get each day/week/month, it's all useful! The shop economy is good and spawn isn't anywhere near as laggy as others I've been to. There's also plenty of opportunities for new players to succeed in whatever task they've set out to do. So all in all, great server and 10/10 would recommend to any pixelmon fan. Pokeworld is an absolutely fantastic server. The mods are extremely friendly and the community as a whole is just very helpful and kind. I have yet to find a better pixelmon server. Friendly community, always willing to help if they know the answer, including a staff team which is reliable, I absolutely love this server. Amazing server, great staff and a very helpful Owner, everyone is treated equally and everyone is helpful, would 100% recommend playing on. Awesome server! Nice staff, friendly community, exciting events and they is waaay more awesome stuff the server has for offer. I recommend to join this server because its the best! The server is amazing the server and community is great and the staff are really helpful, there has been many great improvements to the server and the Owners have worked really hard to get in all the plugins! Pokéworld in my view is one of the best pixelmon servers out there, small yes but the community is building and friends are being made. This server is great for people who are sick of bad staff, no legends and rude players! Pokeworlds staff are so helpful and u can really get to know them, I insist to anyone that sees this message GO PLAY POKEWORDL!! !